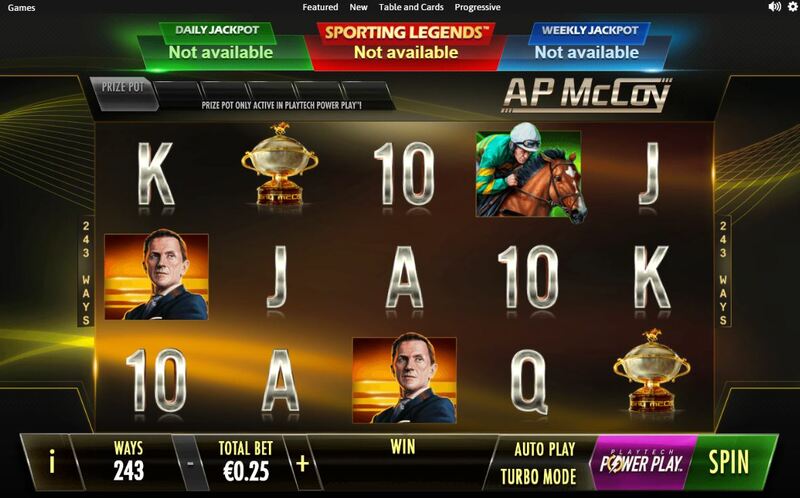 AP McCoy slot is about the legendary jumps jockey hailing from Ireland who holds the UK record for most winning rides and has since retired. This fact earns him a place in the Ash Gaming/Playtech hall of fame alongside Frankie Dettori, Football Stars and Ronnie O'Sullivan who all have slots in their honour. The game is introduced with the man himself's voice and we have classical music while we play on the plain brown reels that feature images of him and the many trophies he won. So will we get across the finishing line with our bankroll, or will it fall at the first fence? The first, Accumulator mode, costs 10 times your total bet to play and consists of 5 spins with a win accumulator. During these 5 spins, wins on each spin are added to the Prize Pot. Wins on subsequent spins during Accumulator mode also award the current value of the Prize Pot. 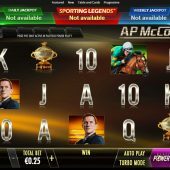 The second, Accumulator Plus mode, costs 20 times your total bet to play and consists of 5 spins with a win accumulator, Wild symbol collection and an extra Super Spin. During the 5 spins, wins on each spin are added to the Prize Pot. Wins on subsequent spins also award the current value of the Prize Pot. Each losing spin collects 1 Wild symbol. On the extra Super Spin, all collected Wild symbols are added to random positions on reels 2-5. You get 10 free games when you land a segmented bonus wheel scatter on reels 1,3 and 5. You get to spin the wheel which offers cash awards of between 4 and 1000x your stake, 5 extra spins, Wild multiplier and overall bonus multiplier. You can get a maximum of 30 spins, 7x Wilds and 7x overall multiplier. Wilds are multiplicative so assuming you got to 7x Wilds on the bonus wheel and landed 4 of them in a winning 5OAK you'd see a multiplier of 2401x and that's before any overall bonus multiplier you had in play. Yeah, right! Anyway, now the fantasies are out of the way, you spin the bonus wheel for free spin enhancements until Tony McCoy's chance disc in the centre says Free Games instead of Spin. Don't expect too many enhancements before the spins begin.